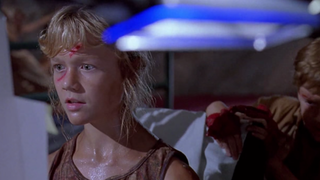 Every nerd born before 1990 knows the Jurassic Park hacking scene. "It's a UNIX system—I know this!" Now, thanks to some nostalgic developers, you too can hack into the mainframe. A newly developed game mimics the 3D interface that Lex conquered to save everyone from the dinosaurs over 20 years ago. It's pretty fun! It's called " I Know This." Like in the movie, the objective is to find a file, and the only way to do it is to hack into certain folders. But just like in the real world, some of these folders contain treacherous malware. Unlike any reality, "hacking" involves mashing on your keyboard as fast as you can. A weird animated purple arrow with hands offers helpful hints along the way.